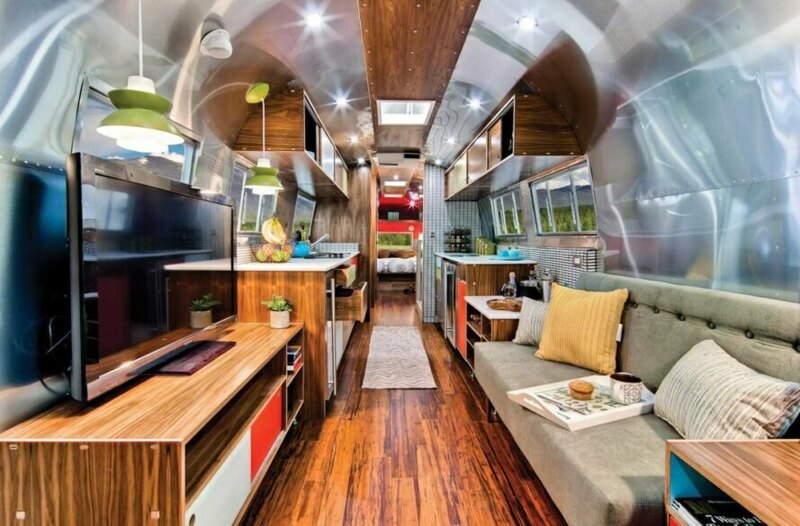 When it comes to restoring old Airstreams, there’s a bevy of beautiful design options out there. 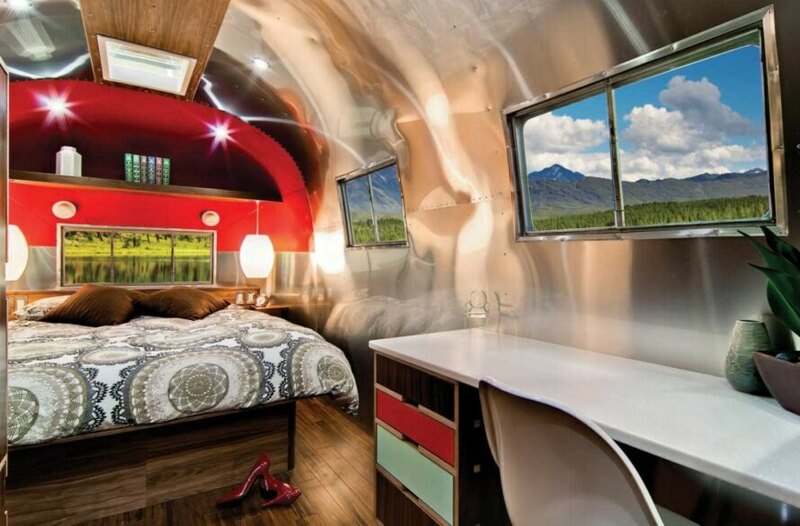 But the expert team from Colorado-based Timeless Travel Trailers has just unveiled a marvelous Airstream conversion that is really one for the books. The company had its task cut out for itself when a client asked Timeless Travel Trailers to restore a rare, almost 60-year-old trailer. The result? A gorgeous interior design scheme that pays homage to the Airstream’s midcentury origins thanks to a shiny aluminum interior skin, bamboo flooring and plenty of wood paneling. Like most aging Airstreams, this trailer has a very interesting history. 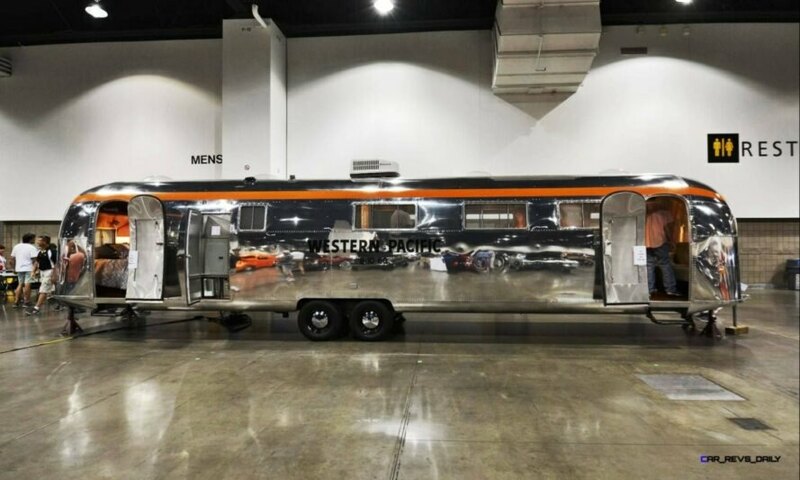 In 1962, the Western Pacific Railroad Company commissioned 10 40-foot Airstream trailers to be used as housing for workers laying rail track. The provided trailers were different from Airstream‘s typical size and layout in that they were manufactured by riveting two 20-foot trailers together. When Union Pacific Railroad acquired Western Pacific in 1989, most of the 10 trailers were put out to pasture, either completely destroyed, put in museums or auctioned off, which is how one man became the proud owner of one of these unique trailers. 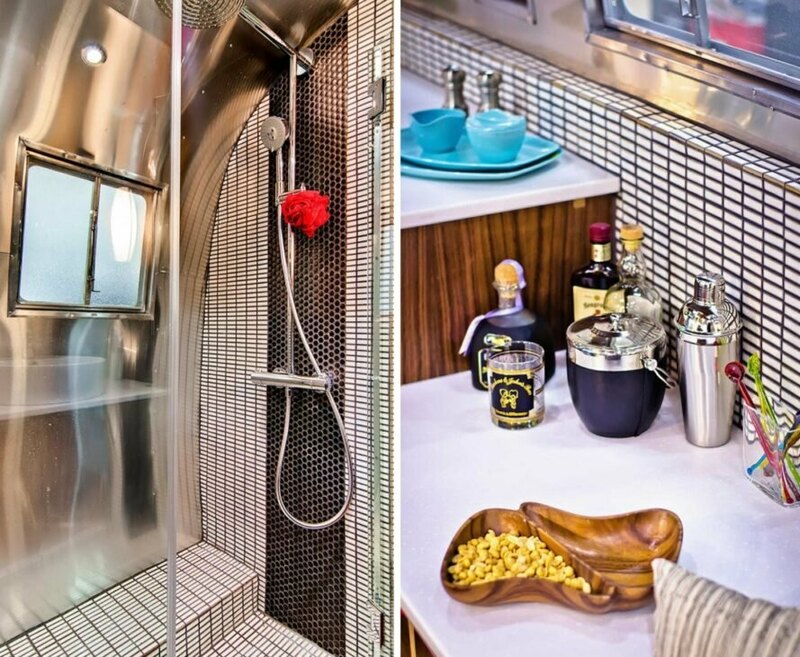 When tasked with converting the Western Pacific Airstream into a modern living space to be used as a vacation home, the team from Timeless Travel Trailers used the trailer’s history as inspiration. 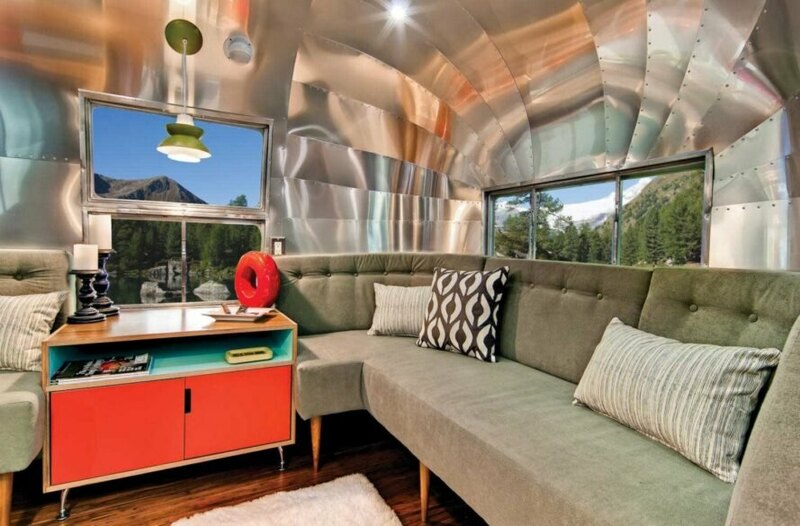 Once the exterior was gleamed back to the oh-so-recognizable Airstream shine, the interior was outfitted with a remarkable design worthy of the trailer’s storied past. The first thing to catch the eye is the glimmering aluminum skin that covers the walls and ceiling, creating a vibrant atmosphere that is enhanced by an undeniable mid-century flair. An extra-wide galley provides ample space for the central living room, which features wide-plank bamboo flooring and cabinets made out of a rich walnut veneer. A custom-made sofa wraps around the space, providing plenty of room for socializing, something not often possible in most Airstreams. Additionally, horizontal windows provide optimal natural light that reflects playfully off the aluminum walls. In contrast to the heavy wood features and furnishings, the kitchen and bathroom feature solid white counters and geometric black-and-white ceramic backsplash. Throughout the space, additional furnishings speak to the midcentury style, such as the lime green pendant lamps and bright red accent walls. 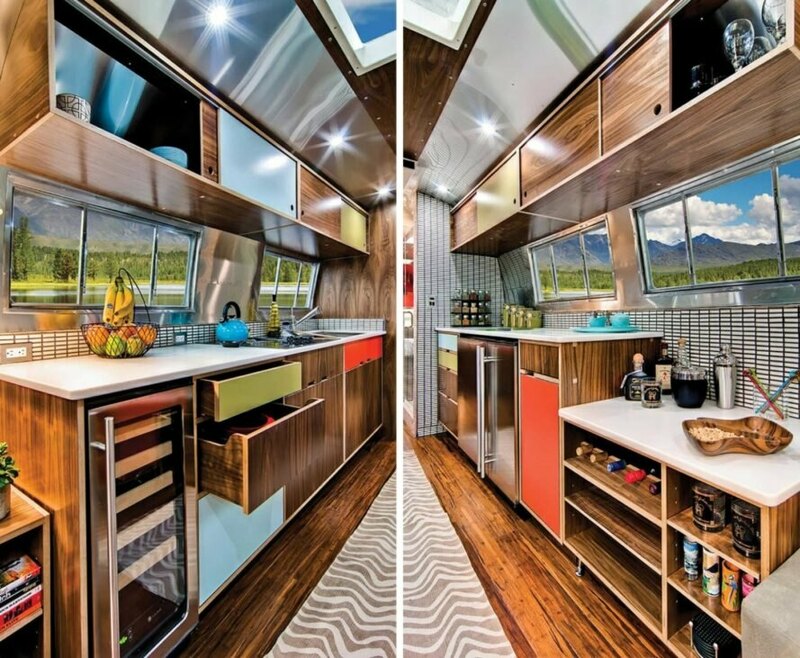 The expert team from Colorado-based Timeless Travel Trailers has just unveiled a marvelous Airstream conversion project. The trailer was once used as housing for railroad workers. The interior space is lined with an aluminum skin. 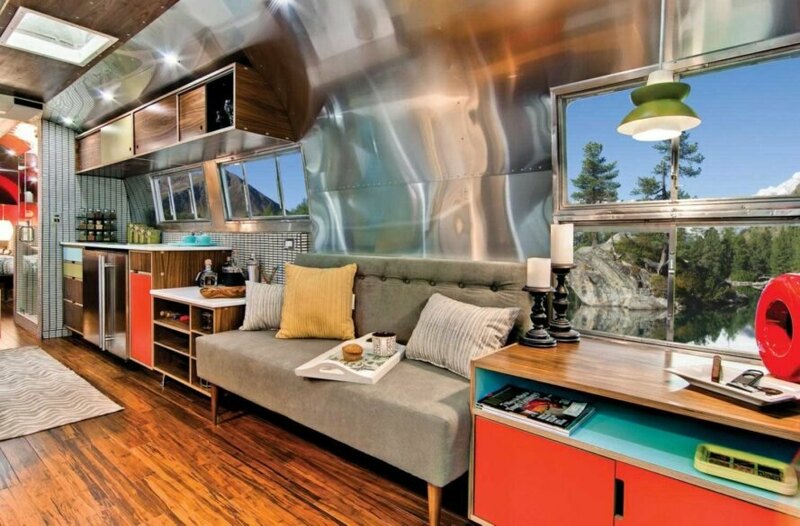 The interior design pays homage to the trailer's history. Rich walnut cabinetry and shelving adds to the midcentury flair. The living space features custom-made furniture. A long, curved sofa was installed into the rounded end of the trailer. The sleeping space features a red accent wall. Plenty of wood paneling is a nod to the trailer's midcentury days. White countertops and black-and-white blacksplash contrast the wood features. The living space was equipped with plenty of storage.